The ownership of the Canadian firm Island Tug and Barge has changed with the purchase by the U.S. parent company Tidewater Inc. The firm is now known as Island Tug.The second tug, with the hull and superstructure completed and with the Cummins K38s installed still requires more work, was also launched in early May of 2018.The vessels were built in a warehouse on the Fraser River. With no launching facility and a railway track between the yard and the steep bank of the river, it took some innovative heavy lifting. Marine engineering teams from diesel power specialist Royston Limited have carried out the overhaul of turbochargers on two offshore supply ships operated by Tidewater Marine in the oilfields off the coast of South West Africa. Royston said its engineers completed the full overhaul of Napier NA297 turbochargers on the Melton Tide firefighting and offshore support vessel and the success of this work led to more recent service work being undertaken on the Netherland Tide, multipurpose support vessel. 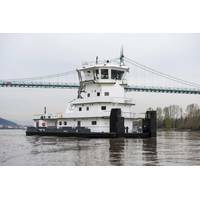 Tidewater Transportation and Terminals, headquartered in Vancouver, Washington, has taken delivery of Crown Point, a new custom-built towboat commissioned at Portland’s Vigor Industrial. Crown Point is the first of a series of three towboats being built at Vigor for Tidewater, and will join the company’s current fleet of 16 vessels and 160 barges. Marc Schwartz, Maintenance & Engineering Manager at Tidewater, expressed, “The launching of the Crown Point, and the forthcoming Granite Point and Ryan Point vessels, marks an important step for Tidewater. Leevac Shipyards Jennings LLC, of Jennings, LA, a subsidiary of Leevac Shipyards, LLC signed contracts with Hornbeck Offshore Services, LLC, an affiliate of Hornbeck Offshore Services, Inc. (NYSE:HOS) of Covington, La., for the construction of two STX Marine SV 310 Multi-Purpose Supply Vessels; 302 x 76 x 26-ft,, 12,070 BHP diesel electric powered MPSV’s. 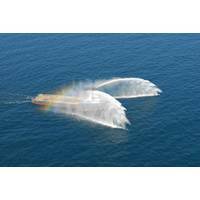 “These will be the twenty-third and twenty-fourth vessels to be built by Leevac for Hornbeck” said Christian Vaccari, President and CEO of LEEVAC. 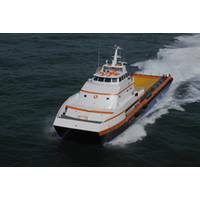 Leevac Shipyards Jennings LLC, Jennings, La., signed contracts with Aries Marine, Inc of Lafayette, La., to build two LEEVAC Design Services “LDS” 270 DE PSV, a 270 x 56 x 21.5 ft. diesel electric Platform Supply Vessels (PSV). “We are very excited to have this opportunity to begin this partnership with a company like Aries Marine” said Christian Vaccari, President of LEEVAC. The LDS 270 DE PSV will have a deadweight capacity of 4000 LTsw and will carry more than 13,000 barrels of liquid mud. Each will be powered by four 3516C Caterpillar generators rated at 1825 kw each. 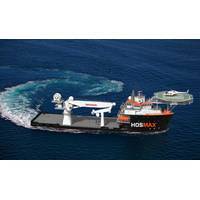 STX OSV Holdings Limited say Tidewater Inc. has acquired contracts for 3 Platform Supply Vessels (PSVs) under construction at STX OSV in Norway. 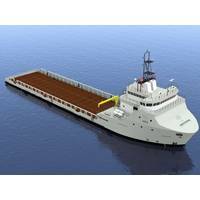 STX OSV had originally secured the contracts for the design and construction of three vessels for STX Pan Ocean Co. Ltd. in 2010, and Tidewater has now entered into an assignment agreement with STX Pan Ocean to take over these contracts. The first vessel in the series will be delivered to Tidewater during 1Q 2013. Deliveries of the next two vessels are scheduled for Q2 and Q3 2013. Mr.
Cargotec has secured a comprehensive MacGregor offshore equipment contract for six platform supply vessels (PSVs) from Fujian Southeast Shipyard in China. 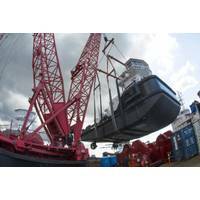 The vessels are being built for leading US offshore support vessel owner, Tidewater Marine LLC, and the equipment is scheduled for delivery between the first and fourth quarters of 2013. Each 75m vessel will feature a MacGregor equipment package comprising a number of auxiliary winches such as anchor windlass, capstans and tugger winches, a single deck crane and a bulk handling system. Newport News Shipbuilding employee Greg Hoefflin has been named an Outstanding Apprentice for 2012 by the Virginia Apprenticeship Council. 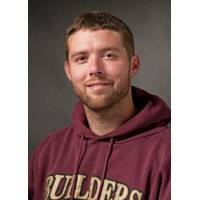 Hoefflin, a 2012 graduate of The Apprentice School at NNS, is the ninth Apprentice School graduate to receive the honor since it was first awarded in 1998. The Virginia Apprenticeship Council, in association with the Virginia Department of Labor and Industry, sponsors the annual awards program to honor outstanding apprentices who represent the best of what apprenticeship has to offer. Apprentices are nominated by their sponsoring organizations. The motto at Guido Perla & Associates, Inc. (GPA) for over thirty years and continuing to this day has always been: Engineering Ideas into Reality. For clients worldwide, no matter how large or small the project, from single vessels to an unprecedented number of vessels in one series, the adage rings true. Behind the company’s success and commitment to each and every client is a team of over 70 professionals on four continents, led by the company’s Chairman Guido Perla and supported by his management team. Bay Shipbuilding in Sturgeon Bay, Wis., has awarded the Siemens Division Industry Solutions a multimillion Euro contract to equip two platform supply vessels (PSV) with a diesel electric propulsion system. The ships are being constructed by Tidewater Marine LLC, a Tidewater Inc. subsidiary. They are slated for delivery in the fourth quarter of 2012 and the second quarter of 2013 respectively. 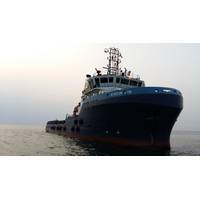 Siemens will outfit two new PSV of Tidewater Inc. with a Bluedrive multi-drive low-voltagepropulsion system. Siemens Industry, Inc. announced today that it has been awarded a multi-million dollar contract to equip two platform supply vessels (PSVs) with its diesel electric propulsion solution at Fincantieri Marine Group's Bay Shipbuilding Company in Sturgeon Bay, WI. A Tidewater Inc. subsidiary will construct the vessels. The two deepwater PSVs will be outfitted with Siemens Blue™ multi-drive low-voltage propulsion system which improves reliability due to failsafe features that will help the vessel owner lower maintenance costs, and increase efficiency and operational ease for the vessel and crew. 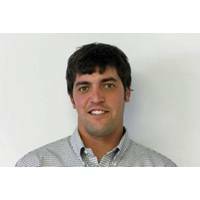 Bay Diesel & Generator announced the promotion of John Small to the position of Inside Sales Coordinator. Small joined Bay Diesel & Generator in 2008 as a field service technician. After an exemplary performance in technical training and product orientation, Small was asked to join the Bay Diesel & Generator Sales team. Small's change in position coincides with a change in his career path, as he begins to pursue a degree in Business Management from Tidewater Community College.